Part of this weekend has been spent fixing holes in socks. (More in another post. I know you can't wait.) I really like this pair. I think Carole gave these to me. They are lighter in weight than others and, in the summer, that's perfect. Being lighter in weight, however, means they have worn quite a bit faster than others. 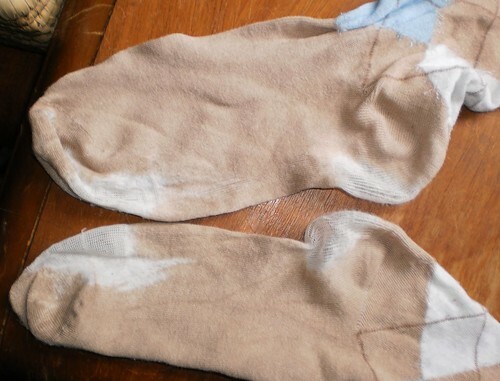 I washed these over the weekend and was sorting socks into pairs. Taking a good, long look at them, I honestly don't think I can darn them enough to make them solid. I'm sad. It's not like this is my only pair, far from it. I have dozens of socks. I love loud colored or patterned socks and that's a great thing to get me for birthday or Christmas. They all feel like friends so it's hard to add this to the give away bag, for it's like I'm giving away a friend. And yet, friendships come and go. This one has come to the end of its useful life. It gave me an incentive to fix the holes in the socks in the mending pile.